I’m so excited to be hosting not one, but TWO blog hops! Every Friday, I co-host The Spin Cycle with Gretchen from Second Blooming. I’m totally thrilled that after she wrote about her love for acting she got a guest role in Modern Family! It aired this past Wednesday, so I hope you caught it! Today I’m also a guest…as a co-host of the Ladies Only Blog Share Linky Party with several of my co-authors. We have been working together on our book, The Mother of All Meltdowns, for an exciting few months. I’m so pleased I’ve gotten to know these wonderful ladies! They are all listed down below. This week, our theme is Halloween. At the preschool where I teach, we have been singing a lot of fun Halloween songs, reading Halloween books, and also making some easy Halloween crafts. We have 18 four year olds for only two hours every morning, so making our projects cute yet simple for little hands is important. 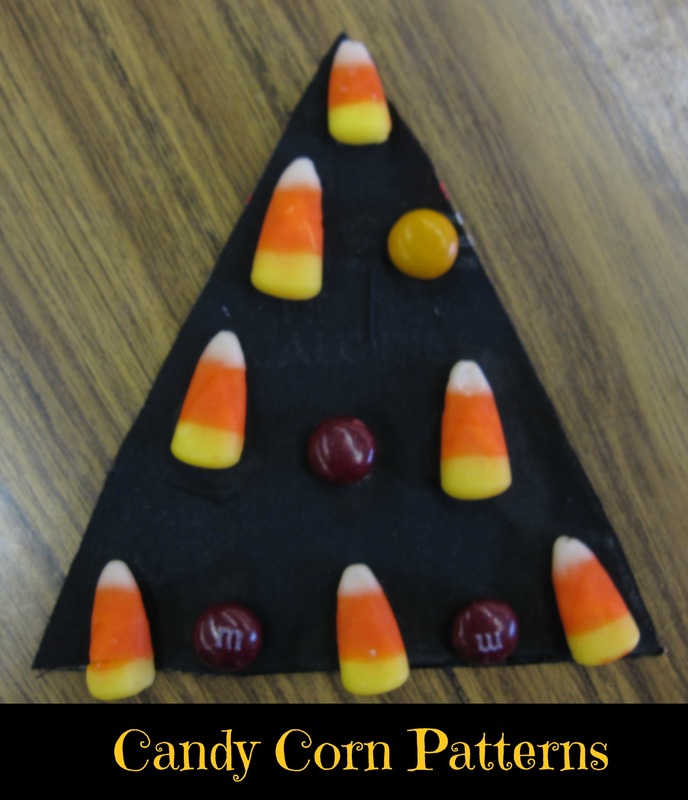 For this candy corn and M&M’s project, we talked a lot about patterns first. The triangles were pre-made; they are cardboard with black fabric glued on top. We then encouraged the kids to lay out their candy pattern on the table first. After they had their pattern ready to go, they glued their pattern onto the triangle. We also talked about how this candy is not for eating. We’re not that mean…we had candy corn and M&M’s for our snack that day! 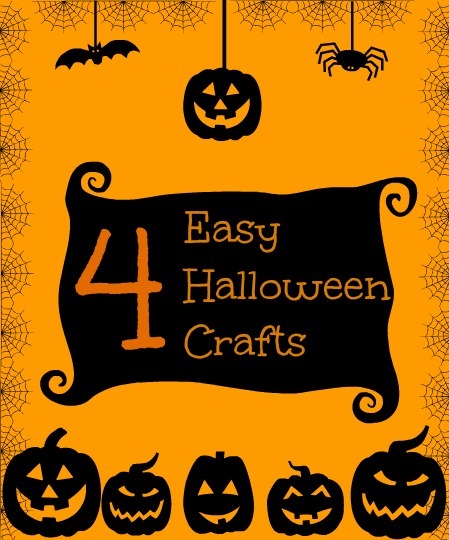 This cute little pumpkin book is a perfect activity to do after diving into a real pumpkin! 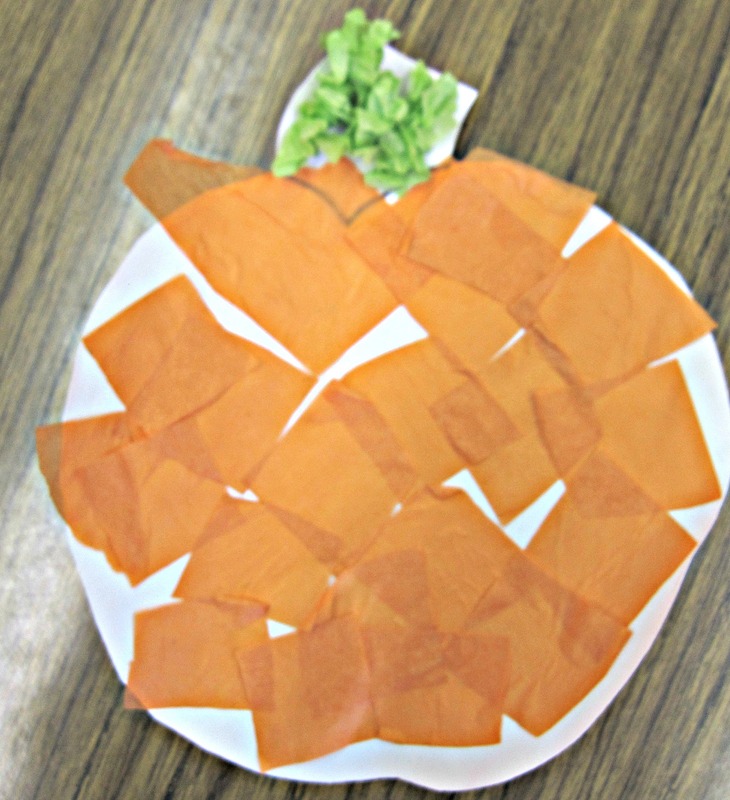 We used a glue stick to glue real pumpkin seeds and orange yard “inside” our paper pumpkin. 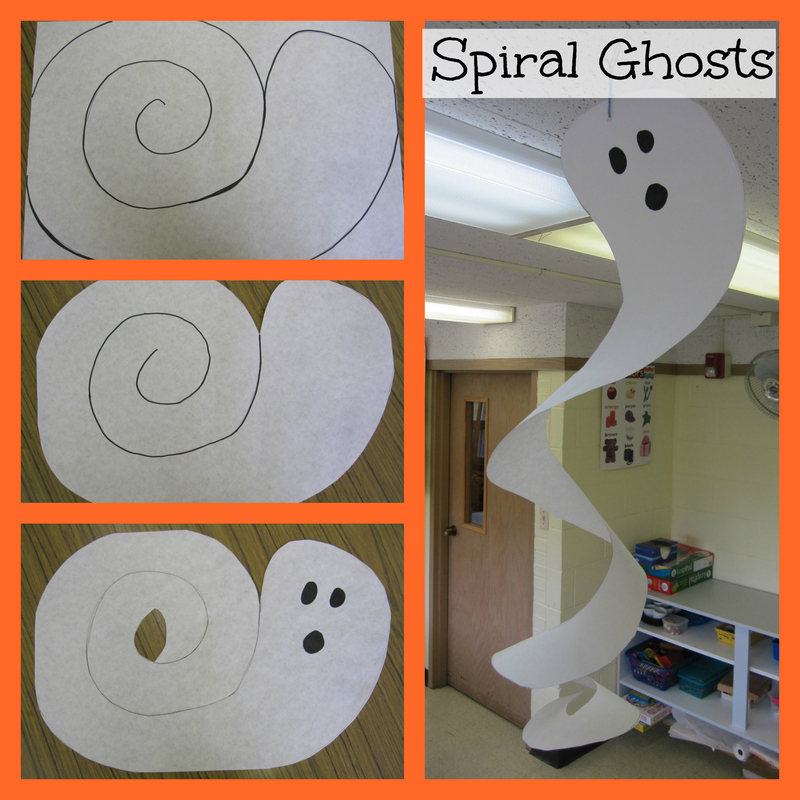 The kids love to use scissors, and these spiral ghosts are perfect for developing fine motor skills! There is so much to think about when you are only four; how to hold the scissors in one hand and the paper in the other, moving the paper around while using the scissors, and making the scissors open and close. It’s a very complicated task! These tissue paper pumpkins were so easy to make, and yet turned out really cute! The kids used a paint brush to “paint” white glue on the pumpkin shape (made out of tagboard) and then put tissue paper squares on the glue. They crumbled up green tissue paper for the stems. You could even add a jack-o-lantern face with black paper, if you’re ambitious! What have you been doing to get ready for Halloween? Here is your SPIN CYCLE Linky! Gretchen from Second Blooming and I host Spin Cycle every week. We give you a prompt on Monday, and you are invited to write about the prompt and link up any day of the week with your “spin” on the prompt. On Fridays, Gretchen and I share our Spins. We’d love to have you join the Spin Cycle! Natasha from Epic Mommy Adventures. Cool Ideas. Pretty sure you are more crafty than you give yourself credit. I love the spinning ghosts; so easy and cute. And I’m ashamed to admit it but here goes: I’m keeping the template for summer…don’t they make the cutest snails too before cutting? Just need some antennae. These are fun crafts for kids of all ages. Now I’m going to get my teen busy cuting out ghosts; it’s windy today and they’ll look amazing hanging in our trees! Those spiral ghosts are so adorable!! I’m going to share it with my daughter for babysitting! They are really cute, aren’t they! I still need to make some for my own house! Thanks for co-hosting! I always look forward to the #LOBS weekends! My 3-year-old would be all about the spiral ghost. We’ve got to try that one! Thanks! It’s been so fun, and now I have some great reading material for the weekend! Thanks for stopping by! So happy to co-host with you! And yes, I’m glad to see that candy corn and M&Ms were for snack too. Otherwise it’s so cruel! We have the Modern Family episode on DVR – can’t wait to watch! Oh, those ghosties are fun! I might get in on the act and make a few to decorate my home! Or the staff room at work! Aren’t they cute? I need to make some for my house, too! Ginny Marie, thank you for these! Our 4-year-old grandson is spending the weekend with us, and we’ve been talking about what we can do beyond baking cookies and carving a jack-o-lantern with him (if we don’t have something else planned, he won’t want to do anything besides play Lego Batman on the Wii). This is so exciting to me! I’m glad I was able to give you some ideas, Jan! Bruiser is in preschool this year and he has been coming home with lots and lots of art, songs and recipes to try. They make snacks at his school weekly. It’s so fun to see him excited about school. If I were craftier, we would try these at home. Halloween is just such a fun holiday to do with the kids! The teachers like it just as much as the kids! Hi, Lorraine! Thanks for stopping by! Those are so stinking cute! I’m seriously thinking I might make some of those spiral ghosts myself and hang them on our porch! And thanks for the MF plug! Everybody’s support has been incredible! I think those ghosts are my favorite! And they’re so easy to make, too. Love the little spin ghosts! We may need to make a few this week! Good practice with scissors for my youngest! Those ghosts are very neat looking! I think I need to make some for home, too! I didn’t know you taught pre-school! What fun! I started out as a 2nd grade teacher, and have moved down to 4 year olds. I love it! It’s my pleasure…and so much fun!